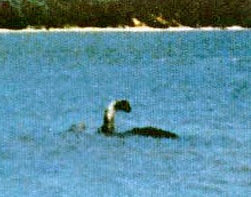 When it comes to lake monsters, most people probably think of Nessie, the Loch Ness monster in Scotland. But there are actually a number of lake monsters around the world--like Champ. 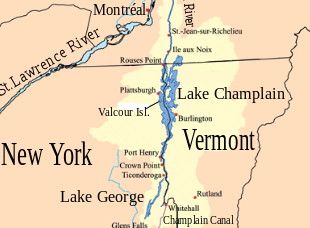 Champ (also known as Champy) is the nickname of the Lake Champlain monster. Lake Champlain is a 125-mile-long fresh water lake between New York and Vermont. There have been over 300 reported sightings of Champ over the years. Legends of the creature(s) date back to Native Americans in the region--both the Iroquois and the Abenaki spoke of the creature; the latter calling it "Tatoskok". The founder of Québec and the lake's namesake, Samuel de Champlain allegedly claimed to have sighted Champ in 1609. Champlain described it as a "20-foot serpent thick as a barrel, and a head like a horse." However, the accuracy of this story is questioned, and many believe it a fabrication to further the legend of the region's own lake monster. In 1819 a "Capt. Crum" reported sighting an enormous serpentine monster estimated to be about 187-feet long. He further claimed to have witnessed it being followed by "two large Sturgeon and a Bill-fish". He described it as having three teeth and eyes the "color of peeled onions". He also described it having "a belt of red" around its neck and a white star on its forehead. Today, the Champ legend continues, with the creature serving as a mascot for local sports team, and several businesses using an imagined image of the creature for tourism. Just what is Champ? A prehistoric remnant, amphibious dinosaur? Or maybe an illusion? One of the most common skeptical theories for lake monsters is misidentification. Sightings of long, sinuous creatures mving through the water are often revealed to be merely a wake caused by subsurface currents. Logs and other debris floating in the water can play tricks on the eyes, making an observer think they see something that isn't there. For this theory to hold true--that Champ is nothign more than an illusion--one would expect to see Lake Monsters around the world. Which is entirely true: Nessie and Champ are joined by Caddy (Cadboro Bay, British Columbia) and Ogopogo (Okanagan Lake, British Columbia). On March 21, 2018, it was reported across the internet that a strange creature resembling a prehistoric creature had been found on a Georgia beach.